You have to have a thick skin to be a columnist. I went off the idea of blogging regularly when I published a think-piece about an offhand remark Josie Long made onstage and Jason Manford responded by saying that I didn’t have to turn every thought into a column. 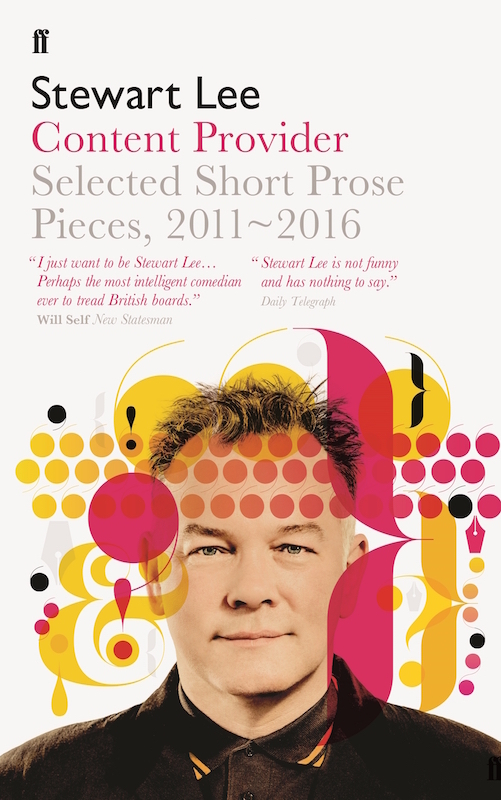 Stewart Lee must have the hide of an elephant as he has managed to turn out enough Observer, Shortlist & New Statesman columns (plus a press release for the band Wolf People who I assume really exist) in five years to fill this book. Then again, he is probably a better writer than me and someone who has the ability to make pertinent points and get a laugh on subjects as diverse as Spotify playlists, duck pate, UKIP, Bill Hicks, the insect community and Grant ‘who he?’ Shapps. Grayson Perry, no less, has called him “a true artist of comedy” while Al Murray calls him “the Grand Poobah of Stand-Up.” One for either Flintstones fans or Gilbert and Sullivan fans there. Despite the book title making it sound like the barrel-scrapings of a desperate man trying to earn a crust by stitching together old work, the candid, opinion-packed, self-mocking-yet-haughty prose is consistently excellent and although I’m already an Observer reader I’m more than happy to re-read him. Lee has nurtured the happy knack of sounding like a fully paid up member of the liberal intelligentsia while constantly skewering the liberal intelligentsia. A subtitle could have been Now That’s What I Call Having Your Cake And Eating It. It is a similar technique to the way he balances positive quotes from fans with hateful quotes from enemies on his promotional posters. Lee set the benchmark for comedy-related books with the densely brilliant, brilliantly dense career-critique How I Escaped My Certain Fate. This newish work does not boast that book’s exemplary copious footnotes. Instead the pages are peppered with online comments responding to Lee’s scribbles at the time of publication. “Who is this fathead and why does he have the weirdest byline photo in the Guardian?” asked James Roberts when Lee wrote about crisps in January 2013. I expect that’s a line he could use on his next tour poster.